Koh Phi Phi is one of the most famous places on earth. The green mountains that rise up from the bright blue ocean form a scenario so beautiful, you’ll see why this Thai island gets so much love. So, it’s not a surprise that Koh Phi Phi attracts all types of travellers from all around the world, from the broke globe-trotter to the biggest celebrities. But, don’t worry, the backpackers have their own place on the island. The northern part of Koh Phi Phi, Loh Dalam Bay, has hostel after hostel, bars and restaurants, beach parties, pool parties and everything a backpacker dreams of. As the centre is pretty small, you can walk everywhere and if you prefer, choose a hostel a bit further away from the parties to have a good night of sleep. Come with me and let’s find the best hostel in Koh Phi Phi for you. If you are looking for a party hostel in Koh Phi Phi, Stones Bar Dorm Rooms And Restaurant is your destination. As the hostel description says, “it is LOUD and FUN”, so if you don’t plan to party until late, consider choosing another hostel. 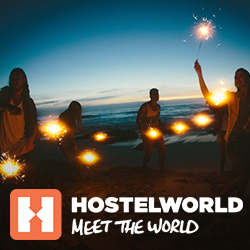 Not only does this hostel have many travellers from all around the world and a very social vibe, but it also turns into one of the biggest beach parties on the island at night. So, get ready to party, it will be crazy! Dormsin’s high rating is well deserved, as this hostel combines many important characteristics for a delightful stay. The staff are nice, the cleanliness and the beds are good, the atmosphere is friendly – enabling you to meet other travellers, and the location is close to the parties and to the main pier. Not a party hostel, but the perfect hostel for the solo back-packer that appreciates comfort but still wants to socialise. Do you like to socialise, but also cherish a good night’s sleep? If that’s a yes, Voyagers Hostel is perfect for you! In the common area, you can make friends and then walk to the island’s parties. Or just have a chill night and rest in your room – these dorms are some of the quietest on the island. The very friendly staff will also help you to feel at home and will help you have the best Koh Phi Phi experience. Ibiza House Pool Party is not only in the middle of the party scene, it IS the party scene. The pool party is one of the busiest on the island and by staying here, you get a free ticket to it. At the same time, this can be one of the best hostels in Koh Phi Phi for couples, as its private rooms are spacious and peaceful. This is definitely one of the best hostels in Koh Phi Phi for solo travellers. Blanco City Hostel has a great atmosphere and hosts sociable travellers from all around the world. This customer review pretty much sums it up: “Amazing staff, super clean rooms, nice facilities. Located just off the beach so it is a lot quieter than the beach front hostels”. Hangover Hostel is the place to be if you want to meet travellers in the easiest way possible: just hanging around. Many “Hi! Where are you from?” can be heard around the hostel and the common area turns into a lively bar at night. As many reviews point out, Mr. Singh, the hostel owner, is very welcoming and helpful. Blanco Beach Bar is one of the most famous party hostels in Koh Phi Phi – and there is a reason why. At night, the area in front of the hostel, on the sand, turns into a massive party with games and shows. At daytime, you can join the Blanco Boat Parties and have fun surrounded by some of the most iconic landscapes in the world. I hope this guide helped you to choose your hostel on the iconic island of Koh Phi Phi. Grab your sarong, remember to put on a lot of sunscreen and enjoy one of the most amazing places on earth. Kapkunkaaa!